i have a 1980 cb 750 custom.i have had it for a couple of yrs.seeing your bike as given me new interest in building mine.thanks. Well done. Good looking ride. Did you keep the original sidecovers from your bike? I´m looking for side covers for CB 750C. If you still have it, specially right side, please let me know at luciobdefreitas@gmail.com and I will buy it. 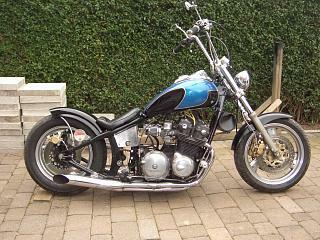 We don't see a lot of CB750cc choppers here in the States anymore, not like we did in the 70's. I always admired them and still do, when they're done right. This one's been done right! I like the graphics on the tank. Eye grabbing yet simple. And the look of the inline four cylinder engine is something I always liked too, not to mention the fact that they're some of the most dependable and strongest running engines ever engineered.. I would be proud to ride this bike.